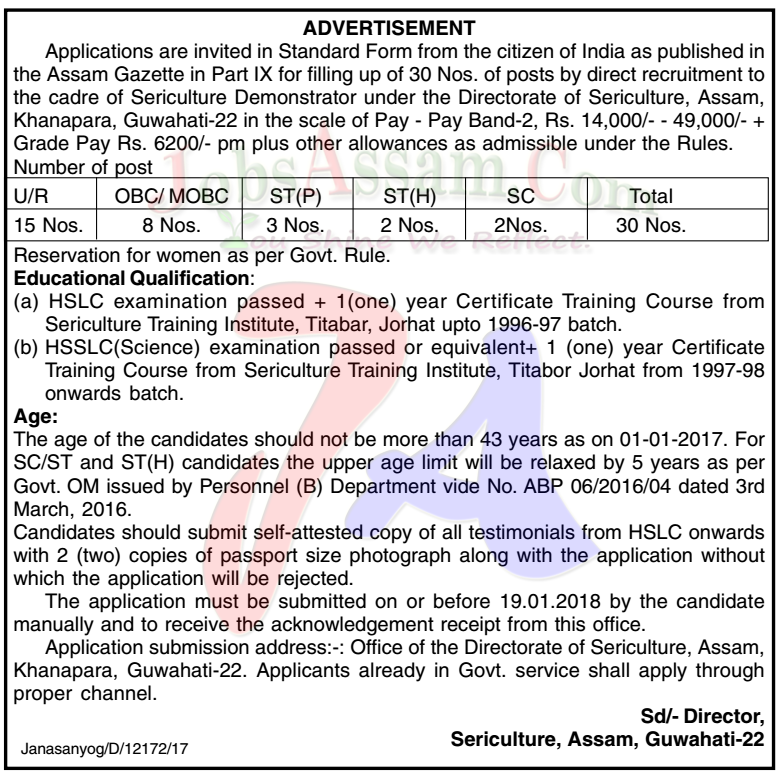 Applications are invited in Standard Form from the citizen of India as published in the Assam Gazette in Part IX for filling up of 30 Nos. 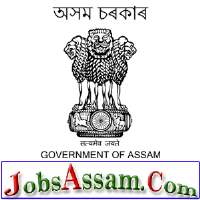 of posts by direct recruitment to the cadre of Sericulture Demonstrator under the Directorate of Sericulture, Assam, Khanapara, Guwahati-22 in the scale of Pay - Pay Band-2, Rs. 14,000/- - 49,000/- + Grade Pay Rs. 6200/- pm plus other allowances as admissible under the Rules. OBC/ MOBC - 8 Nos. (a) HSLC examination passed + 1(one) year Certificate Training Course from Sericulture Training Institute, Titabar, Jorhat upto 1996-97 batch. (b) HSSLC(Science) examination passed or equivalent+ 1 (one) year Certificate Training Course from Sericulture Training Institute, Titabor Jorhat from 1997-98 onwards batch. Age: The age of the candidates should not be more than 43 years as on 01-01-2017. For SC/ST and ST(H) candidates the upper age limit will be relaxed by 5 years as per Govt. OM issued by Personnel (B) Department vide No. ABP 06/2016/04 dated 3rd March, 2016. How to Apply :Candidates should submit self-attested copy of all testimonials from HSLC onwards with 2 (two) copies of passport size photograph along with the application without which the application will be rejected. The application must be submitted on or before 19.01.2018 by the candidate manually and to receive the acknowledgement receipt from this office.